Elise carries a notebook full of tallies, each page marking a day spent at her new public school, each stroke of her pencil marking a word spoken. A word that can't be taken back. Five tally marks isn't so bad. Two is pretty good. But zero? Zero is perfect. Zero means no wrong answers called out in class, no secrets accidentally spilled, no conversations to agonize over at night when sleep is far away. But now months have passed, and Elise isn't sure she could speak even if she wanted to―not to keep her only friend, Mel, from drifting further away―or to ask if anyone else has seen her English teacher's stuffed raven come to life. About the Author: Christina Collins grew up in Massachusetts and now lives in Northern Ireland, where she's always on the lookout for castle ruins and secret gardens. She holds an MFA in creative writing from George Mason University and is pursuing a PhD in creative writing at Queen's University Belfast. She has taught at both universities and has been a writer-in-residence at the Kimmel Harding Nelson Center for the Arts as well as the Art Commune program in Armenia. 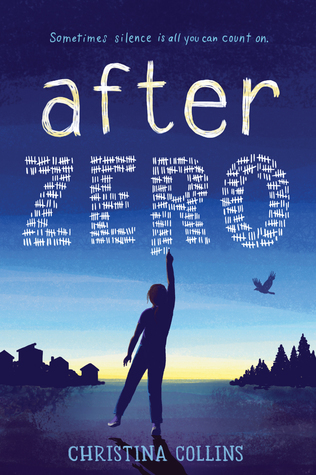 After Zero is her debut novel. Learn more at christinacollinsbooks.com, or follow her on Twitter (@stinacoll). My Review: This book is perfect for the loaner reader. It is one of those books that is good for both girls and boys and is beautifully written. This is one of those books where you just can't help but feel for the main character. It is a real struggle through life kind of book that you just can not put down. I did think that it could have been sped up just a little. As parts were a little stagnant. But it didn't take away to much of the story.